Now available in light pink, ankle length diabetic socks are great for women with swollen feet or diabetes that prefer the fit of a lower cut sock. These socks are made for women who want comfort and the benefits of improved circulation that comes from non-binding socks. Our diabetic socks feature wide tops that stretch out to 11 inches to relieve pressure on your ankles. The 80% cotton and 20% nylon material is soft enough to protect against abrasions and also helps to wick moisture away. 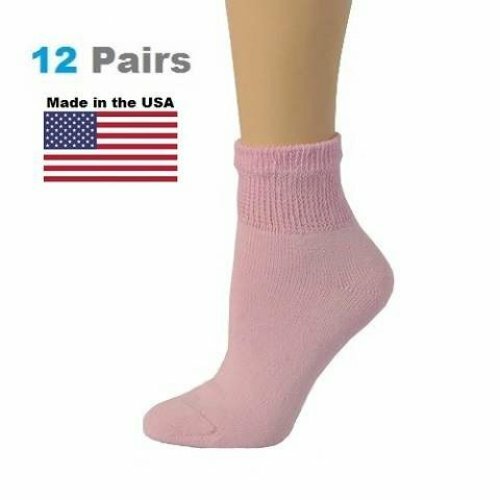 Each pack contains 12 pairs of diabetic ankle socks in pink. Made in America.